China has announced it will spend £60bn this year in an effort to almost double the size of its high-speed rail network. The investment forms part of a project which represents the largest and fastest rail expansion programme in the world. Since 2008, and in the time Britain has taken only to debate the merits of one line - HS2 - which would be just over 100 miles long, China has built 6,000 miles of track, much of it elevated, and invested in 1,000 high-speed trains. The network is currently almost double the combined length of Europe and Japan's railway networks. The programme, the government says, forms a key part of the country's drive to modernise, urbanise and pull the Chinese people out of poverty. Sky News took a ride on the 10am from Shanghai to Beijing. Bang on time, the shiny new bullet train pulled out of the city's Hongqiao station. The train, 16 carriages long, has three classes: standard, first and business, which resembles the interior of an aeroplane. Sitting in a fully reclining airline-style seat is businessman Paul Zhou. He said: "Our country is building an entire high-speed rail system and it has made our travel easier. "It has shortened the journey between cities. It helps a lot on our work and life. "On the airlines, there are always delays. They are very unreliable. "I used to travel by plane, but now I almost always use our high-speed trains to go everywhere. They are comfortable, environmentally friendly, and always on time." Out of the window the Chinese countryside is a blur as the train reaches its cruising speed of 190mph. China now boasts the world's fastest conventional train. The CRH380A, manufactured by the Qingdao Sifang Company, has a top speed of 237mph, but in test runs it reached 302mph. The trains run on a network of new lines, many of which are elevated. Together they knit together more than 100 cities across the country. Each of the cities has a vast new station. Most look more like airport terminals and they are packed - proof that this railway revolution has got China moving. Another passenger, Zhao Changhua, is an office worker from the city of Jinan. She has just started commuting to Shanghai for work - a distance of 535 miles, but a journey time of just four hours. She told Sky News: "It's very comfortable. It's convenient and fast. I'm very proud of it. "It's the result of the fast development of our country's technology. It has given great benefits to our lives. "This is my second time on a high-speed train, I think it's much easier than taking a plane. "Airports are far away from the city centre while train stations are closer. So I choose high-speed trains." The journey from Shanghai, west, then north, to Beijing is 800 miles - the length of the UK. It is completed in four hours, 48 minutes. In second class, it costs the equivalent of £55, in first it is just under £100 and in business it costs £175. Outside we see glimpses of rural China carved up by the new lines, but we also spot new cities springing up. It is evidence that the new rail network is stimulating the local econoOf all the passengers we spoke to, none had a bad word about the service. Most hoped that China could help the UK with its high-speed train development. Mr Zhou said: "I hope the British government will use Chinese technology, let China help you to build your high-speed railway." What none of the passengers realise is that the train they are on is actually designed, in part, with the help of a UK firm. Priestmangoode is a design consultancy based in the UK but with a growing footprint in China. The company has combined the UK's flair for quality design with China's willingness to pay for it. Roland Boal, head of Priestmangoode's China division, explained that China's "can do" attitude and seemingly bottomless pockets are a huge opportunity. He told Sky News: "There is a hunger for new and exciting things. China is moving really fast and moving forward. "There is a certain sense of excitement among people here and I think they want products that reflect that, whether it's a train or a plane. "If it's a high-speed train, then make it look really fast. Not pared back; make it look fast. "Western companies need to pay a lot more attention to what's happening here.my at every stop. "I get very upset when I hear things like 'of course it broke, it was made in China' or 'I don't buy that company's products because they're made in China'. I think there is such an out-of-date attitude towards the obvious capability of manufacturing in China." This railway revolution is not without significant controversy, though. In 2011, two high-speed trains collided. Forty people were killed and 172 others injured. Had the trains been travelling at full speed, the number of dead would have been significantly higher. A signalling failure was blamed; the whole project was questioned and almost cancelled. A further controversy stems from the fact that the technology behind the network is not Chinese. In the early stages of the project, China bought high-speed train sets and technology from Canada's Bombardier, Japan's Kawasaki, Germany's Siemens and France's Alstom. Chinese engineers then combined these technologies and produced their own trains. Corruption has also plagued the project. In July last year, the country's railways minister, Liu Zhijun, was jailed for corruption, bribery and abuse of power. His demise brought the financial cost into focus. At the last count, the existing project had cost £24bn through Chinese government loans, according to figures published in the Chinese state media. The government hopes to recoup some of those costs by selling its success abroad. China is in talks with countries including Romania, Georgia, Thailand, Burma and several in South America. There is also a desire to help the US and the UK with their own projects. The Chinese government, which runs the network through its Ministry of Transportation, declined our request for an interview for this report and refused Sky News all official access to their trains and stations. No reason was given. The report was compiled without their agreement. However, speaking to the Chinese media, and addressing the safety concerns, Deng Xiaojun, deputy chief engineer of Qingdao Sifang, one of the state-owned locomotive manufacturers, said that the trains are designed according to international standards and in some areas even stricter. He told China's Xinhua news agency: "We have a rounded mechanism to ensure the train's safety operation." Back on the train, and on time - almost to the second - the 10am from Shanghai pulls into Beijing South station. China has built 6,000 miles of track, much of it elevated, and invested in 1,000 high-speed trains, since 2008. The country has the world's fastest train with a top speed of 237mph. 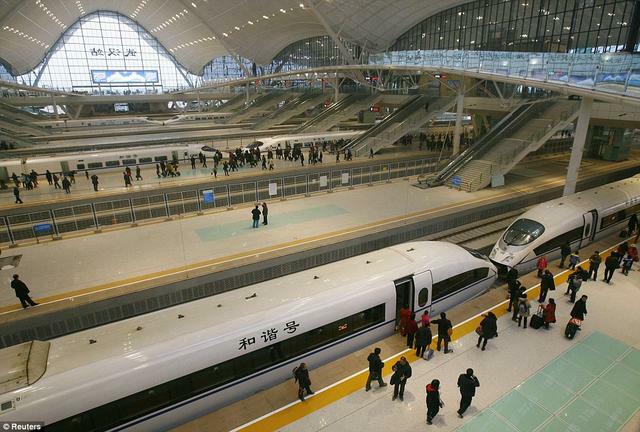 China now boasts the world's fastest conventional train. The CRH380A, manufactured by the Qingdao Sifang Company, has a top speed of 237mph, but in test runs it reached 302mph.. The trains run on a network of new lines. Together they knit together more than 100 cities across the country. The journey from Shanghai Beijing is 800 miles is completed in 4 hours, 48 minutes (= to the distance from Chicago to New York).